Singer/songwriter Adrianne Serna took a break from the stage in order to craft songs for her third album, LET IT SHINE. And it appears that the time was well spent. These lovable songs - which showcase Adrianne's infectious vocals and her wonderfully catchy songwriting - have been featured on commercials for Ford, IKEA, and Kellog's Special K cereal, as well as on ABC's "Mistresses," Bravo's "Ladies of London," NBC's "Minute to Win It," ABC Family's "Jane by Design," MTV's "Friendzone" and "Jersey Shore," The CW Network's "The Beautiful Life," and the "Greening of Whitney Brown" (a feature film starring Brooke Shields and Kris Kristofferson). Now Serna is back in the studio, recording songs for her 4th independent release. "All That's Left is Bliss" is the first song to be revealed off of the forthcoming new album. 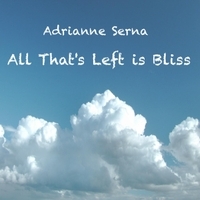 Adrianne Serna has self-released her three independent albums (LET IT SHINE, ANOTHER DAY IN AMERICA, and TIME AND PLACE) and has performed at many venues and festivals throughout the San Francisco area and down the West Coast. Her songs have also been featured on many radio stations including Northern California’s KSRO and KRSH, Tucson's KXCI, Cleveland's WRUW, Honolulu's KTUH, Arkansas' KASU, and Maine’s WMHB. Visit http://sernasongs.com to join the Sernasongs VIP Group and get the song "Let It Shine", FOR FREE.